Springfield, Illinois is a Route 66 stop so the Motherroad is both and dear to many of us. 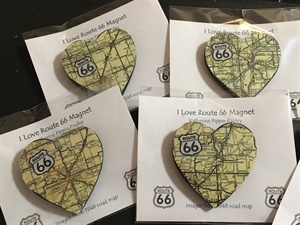 I have made several Route 66 themed items over the years—cards, magnets, shoes, manikins and amulet boxes. 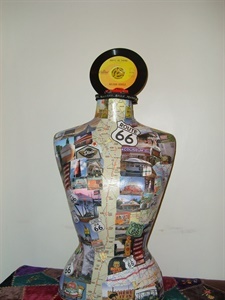 This torso is a tribute to Route 66. I live in Springfield, IL, on old 66. The maps are old ones which show route 66 and the images are from sites along the road. 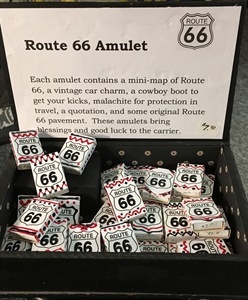 Each matchbox amulet contains a mini-map of Route 66, a vintage car charm, a cowboy boot to get your kicks, malachite for protection in travel, a quotation, and some original Route 66 pavement. The heart is collaged with an image from a 1948 Illinois road map showing Route 66. Content copyright by Katherine Pippin Pauley.